Cooking for Chemo: How is it different from cancer cookbooks? 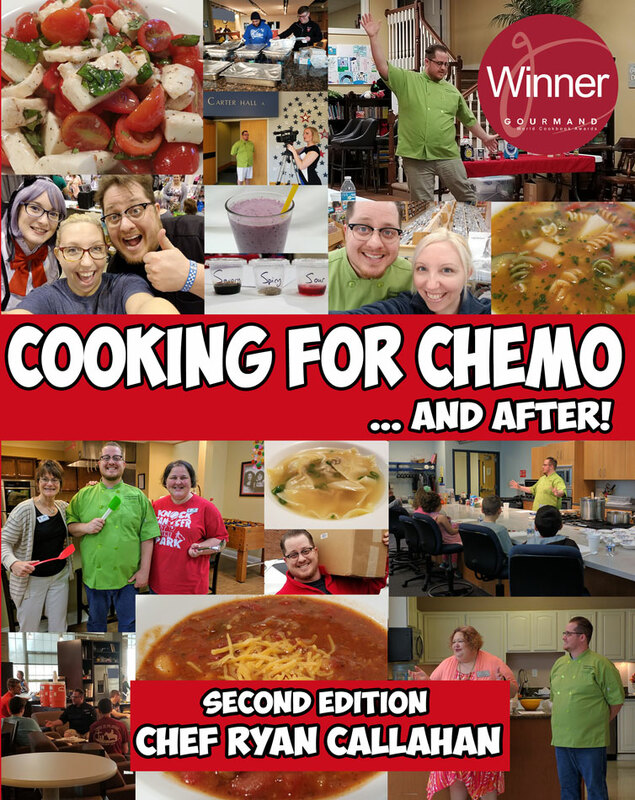 Chef Ryan Callahan has written a revolutionary cookbook called Cooking for Chemo …and After! It is a how-to-cook cookbook that teaches you how to make food taste great again during and after cancer and chemotherapy treatment. Chef Ryan found the inspiration for his cookbook while acting as caregiver for his mother, who herself went through chemotherapy treatment for breast cancer in 2013. The Problem The need for this cancer cookbook was discovered when Chef Ryan became his mother’s cancer caregiver as she went through chemotherapy treatments for breast cancer. Through this experience, he learned very quickly that when a person goes through chemotherapy treatments, there are a ton of flavor changes that occur. Ryan learned that food now tasted horrible for his mother. She quickly developed a loss of appetite, a strong metallic taste, and mouth sores. As a chef, he found this completely unacceptable and worked diligently until he found out how to adjust his flavor and cooking in order to combat these changes from her cancer treatment. The Solution Cooking for Chemo …and After! teaches anyone, from a beginner to a more experienced home-cook, how to adjust your cooking to combat loss of appetite, metallic taste, and mouth sores while going through cancer and chemotherapy treatment. These cooking techniques immediately helped his mother to be able to eat and enjoy her food again while going through cancer treatments. After Chef Ryan’s mom went back for her second bowl of chicken and dumplings, he knew he had to share his flavor and cooking techniques so he could help other people who are also struggling with the debilitating side-effects that occur from cancer treatment. Cooking for Chemo …and After! is a cookbook that is going to completely change the way you approach cooking for someone with cancer and going through chemotherapy treatments. How is Cooking for Chemo different from other cancer cookbooks? Cooking for Chemo …and After! is not a “diet” cookbook or a “what to eat, what not to eat” nutrition guide. Most cancer cookbooks are focused on teaching you about what ingredients and recipes to eat. Cooking for Chemo …And After! focuses on teaching you how to adjust flavor when cooking recipes so you can enjoy your favorite foods again while going through chemotherapy treatments. That all being said, Cooking for Chemo …and After! is packed with healthy recipes, easy recipes, and great cooking tips that help make food and cooking fun again while you go through cancer treatments. The cooking theories Chef Ryan Callahan teaches you can be applied to ANY diet or dietary regimen. You can even take these cooking techniques and apply them to your loved ones favorite foods and recipes! The applicability of these cooking methods to any style of cooking or diet requirements is what sets this cookbook apart from all other cancer cookbooks. Chef Ryan Callahan views this problem (not being able to eat during chemotherapy) completely different than anyone else. You can tell someone what they should or shouldn’t eat. But if the food doesn’t ALSO taste good… they are NOT going to eat it. Period. This belief changes the way we approach cooking for someone going through cancer and chemotherapy treatments. It shifts the focus from what foods you should eat and shifts the focus to how-to adjust the flavor of what foods you choose eat. 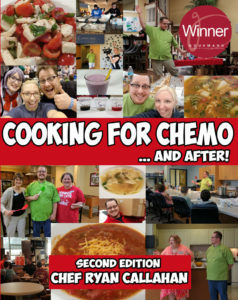 Chef Ryan Callahan’s cookbook, Cooking for Chemo …and After! has a completely different perspective and approach on cooking for someone going through cancer and chemotherapy treatments. Chef Ryan is focused on teaching you about flavor, what is flavor, why you need to adjust flavor, and how to adjust flavor to combat the taste and sensory changes that occur when cooking for someone who is going through cancer and chemotherapy treatments. In his book, Chef Ryan gives you a solid foundation to understand flavor. Most importantly, he outlines his tested and proven flavor and cooking techniques for someone going through chemotherapy, why it works, and HOW to apply these techniques when cooking. Cooking for Chemo …and After! is a cookbook that is going to completely change the way you approach cooking for someone with cancer or going through chemotherapy.